How Debt Collection Works | Prestige Services, Inc. 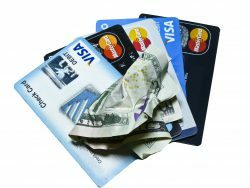 The average credit card debt of U.S. households is approximately $5,700, according to the most recent data from the Survey of Consumer Finances by the U.S. Federal Reserve. The average debt for balance-carrying households is $16,048 (ValuePenguin). If you owe money to a debt collector, do you know how the debt collection process works? Upon missing your first bill, you (the debtor) will start receiving calls and letters from your bill creditor within a few days or weeks (Bankrate). Creditors will attempt a couple different ways to receive the money you owe them: 1) setting up a repayment schedule; or 2) make an agreement to repay or settle the debt. Within three to six months after the first bill you ignored, it’s likely your debt will be turned over to a collection agency or sold to a debt buyer. At this point, your case will be reported to a credit bureau. Creditors can continue to own your debt, but may turn it over to a debt collection agency with a contract to collect. If creditors still own the debt, the collection agency can’t sue you without the creditors authorization (Nolo). Collection agencies are known to move quickly and strike diligently to get the debt paid off. Most debt collectors get paid when they recover a delinquent debt (money owed past the traditional 30-day period by one party); the more they recover, the more they earn (Investopedia). If the creditor decides to sell your debt outright to a collection agency, the collection agency may resort to even more aggressive means of collecting the money you owe. When collection agencies buy a debt from the original creditor, they use more vigorous means to contact you, beginning with more letters and phone calls. If collectors can’t reach you because of old or incorrect contact information, they will use computer software, private investigators, or other sources for update information. Collectors can also conduct searches via your assets (e.g. bank and brokerage accounts) to determine if you’re likely to repay. If a debtor continually avoids all means of contact by the collection agency, the collector may report the delinquent debt to credit bureaus to seriously damage the person’s credit score and/or encourage them to pay. Some collection agencies resort to lawsuits against debtors, especially if the debt is a large sum of money. To sue a debtor, law requires a debt collector give adequate notice of legal proceedings. This includes: 1) a demand letter of notice before litigation begins; 2) a formal “summons and complaint” notification served in person or by certified mail; and 3) a court date is set (Bankrate). If the debtor decides to not show up for the proceedings, debt collectors will get a default judgment leaning their way to collect the debt. Prestige Services, Inc. (PSI Collect) offers a variety of professional collection services for creditors to get what is owed to them. For more information on our business-to-business and commercial collection agency services, please view our “What We Do” page.